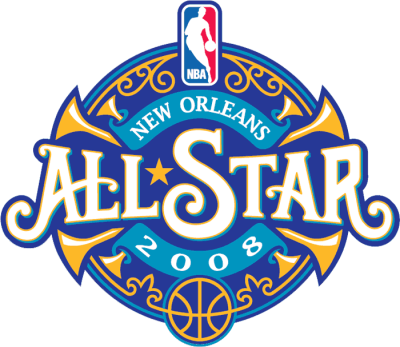 NEW ORLEANS, Feb. 17, 2008 -- Surrounded by an abundance of friends and family members, LeBron James was the center of attention at the postgame photo shoot following Sunday’s NBA All-Star Game. With the game tied and under a minute remaining, James stole an errant pass, dribbled up the sideline and crossed the first defender in his path, Amare Stoudemire, at the 3-point line before rising up to dunk in the face of defender No. 2, Dirk Nowitzki. Besides bringing the New Orleans Arena crowd to its feet, the jam put the East in front to stay en route to a 134-128 victory. “I didn’t want to settle for a jump shot,” said James, who was named the game’s MVP for the second time in three years. “I wanted to be aggressive and try to get to the hole to get the layup. While James’ slam is the play that everybody will most remember from the game, it is not the only reason he received top player honors. Like he has done all season, James showed the world why he is the league’s best all-around player, finishing with 27 points (12-for-22 shooting), handing out nine assists, grabbing eight rebounds, blocking two shots and making two steals. He fell one assist and two rebounds short of the first All-Star Game triple-double since 1997. While some All-Star Games are sloppy due to players trying to get too cute with the ball, this one had the feel of an intense regular-season game. The West wiped out a 16-point deficit thanks to the play of hometown hero Chris Paul, who had 16 points, 14 assists and four steals. The final five minutes of the game, during which the West rallied to take a slight lead only to get its heart broken, are probably getting shown on an instant classic channel right now. Ray Allen helped set the stage for James’ late-game theatrics by draining three 3-pointers in the final 3:15 on the way to a game-high 28 points for the East. James, who was also named MVP of the 2006 game, is the 11th player to win the award more than once.